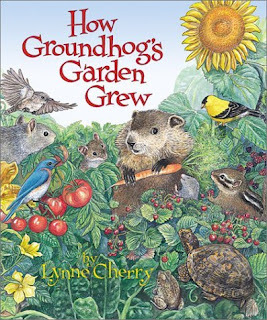 , written and illustrated by Lynne Cherry, is a wonderful book about gardening, and we are thankful we received this gift from our midwife! The story begins with Groundhog stealing food from his friend’s garden, which of course leads to trouble. His friend Squirrel steps in to help teach Groundhog how to grow his own garden. Squirrel teaches him how to cut potatoes for planting, find seeds, space plants, etc. By the end of the book, Groundhog’s garden is bountiful, and he celebrates with a feast with all his friends. for your children too! She is great author and illustrator! We have previously reviewed one of her other books The Great Kapok Tree. That sounds like a wonderful book and I can’t wait to read it! I’ve already asked for it at my local library.